It was not a surprise, this start. Jo and I had picked the departure date two months ago, targeting a weekend when she was free combined with a convenient ebb. The wind would be what it was, and it was usually northwest. Almost a year ago, I had departed for the first Figure 8 attempt. Then, Jo and I had spent our final night together at a hotel just above Horseshoe Cove. This cove, San Francisco Bay’s closest mooring to the sea, rests just below the massive north tower of the Golden Gate Bridge. Mo tugged at her lines as I closed the marina gate behind me and ascended the hill for one last evening alone with my wife, one last restaurant dinner, one last sleep in a bed of soft sheets. At dusk, the fog rolled in from the sea and engulfed the bridge. Then the fog horn kicked into gear. I swear, this horn could be heard by ships as far away as Tokyo harbor; the breadth and depth of its blast could herald the second coming of Christ; it would not simply wake the dead, it would wake them screaming. We shut the hotel room windows and doors; we drew the curtains; we put pillows over our heads. But once in every sixty seconds the horn penetrated all our defenses. We slept little. Next day, October 28, 2017, I departed into fog a shaken man. I had left many times, but never for such a circumnavigation and never after such a night. I hugged friends. I waved to the small flotilla that followed me out. As I rode the ebb under the bridge, Jo quickly drove to Pigeon Point for a last exchange. I never saw her or the point; I never saw the point. The fog had swallowed all, and the wind carried me quickly to sea. This time Jo and I had learned our lesson. On our last night together we enjoyed an evening with friends in Sausalito. They cooked a dinner of lamb and roasted potatoes. Table conversation was politely kept away from the my adventure while, surreptitiously (I thought), I passed scraps to the companionable Lab who pressed his weight against my leg. That night we slept soundly in their cool, quiet guest room above Richardson Bay. Yesterday came on sunny and warm. I felt strangely relaxed. I, again, hugged friends on the quay. Mo and I motored out surrounded by another small flotilla. Again, Jo drove to the Pigeon Point, and this time I could see her. We waved and waved. And here, to my joy, Mo picked up a small wind from the northwest. 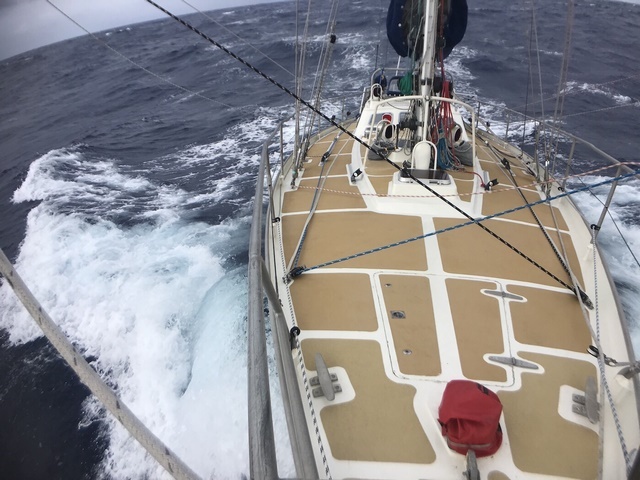 I unfurled the big genoa and we slid slowly out. By mid afternoon we had nearly sunk the land. The bridge towers were but small, dark pins on the horizon. Given my druthers, I would not have departed yesterday. The forecast did not call for this lovely wind, a mere day breeze. It called for flat calm followed by southerlies and rain as the remains of a dead hurricane passed overhead. But the date had been set, plans made. Mo’s sails went limp at dusk. The sea went to glass. Faced with the prospect of bobbing in the shipping channel for a night and a day, I chose to hop Mo up to Drakes Bay. I dropped anchor at 7pm, made a dinner of hashbrowns with corned beef and cabbage and had one more delicious sleep. Half Moon Bay would have been closer, but Drakes Bay is a favorite, a wild place, and by going north, I will cross my own departure track as I come down from the Gulf of Alaska a year from now. Officially, the second Figure 8 began yesterday. For me, it will begin tomorrow when Mo and I head to sea from Point Reyes. Hope he has better luck this time, however the timing seems off. 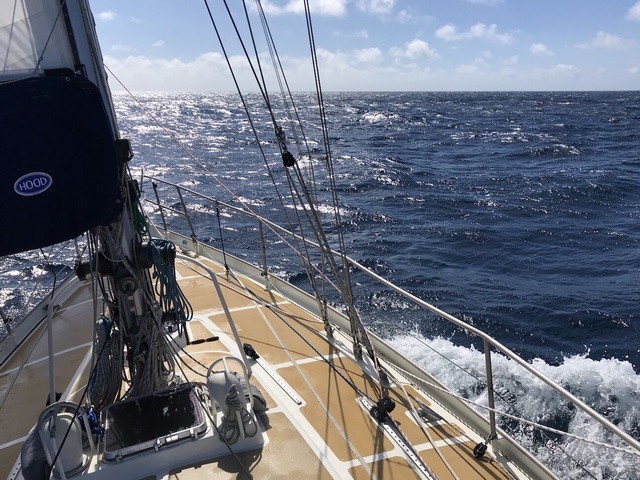 Sail: #1 genoa out full; one reef in main; wind on starboard quarter. Well past the Farallones and on into the evening, the sea maintained the color of jade. As the stars winked on, so did the lights of jets climbing out of SFO, and all night Mo maneuvered between coastwise shipping as she edged further and further out. By morning, all evidence of that other world, the world of the land, was gone. Now the sea was an ebullient blue and empty in all directions until met by a powder blue sky stacked with dry cumulus. Inside the horizon, nothing but water, wave, and wind, available, to the observer, in apparently infinite measure. It is the most amazing thing about this world, the size of it, and that within a day’s sail one can be beyond all evidence of humanity. The vast majority of the planet surface is ocean, and nearly none of it knows the least thing about civilization. Overnight Mo creamed along south under a full main and big genoa. Slowly, but steadily, the wind built. 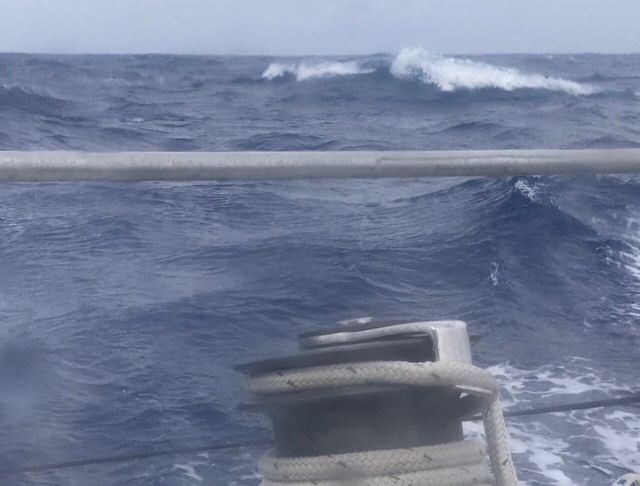 I woke once an hour to monitor passing ships–there were five on the scope at one point–and to worry about when I should take a reef, which I did not do until 3am with winds steady at 22 knots. Reefing the big main with strong wind on the quarter takes care. 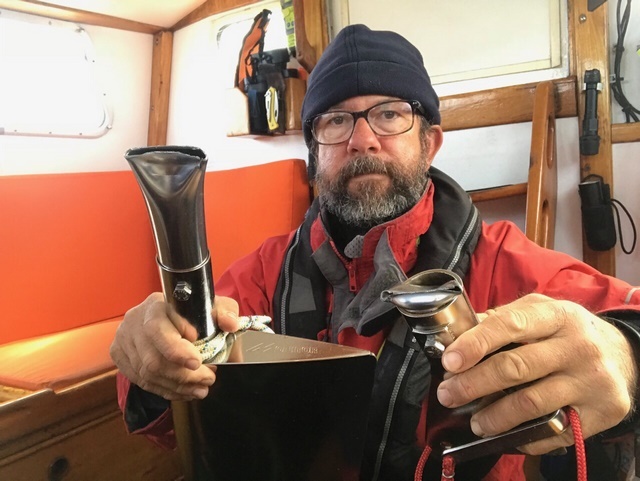 With the sail pressed against the spreaders, the batten cars can foul in the lazy jacks and any slack in the halyard can allow the sail luff to snag the mast steps. I know this and yet committed both errors last night. How quickly one forgets. To clear the luff from the steps, I had to roll up the big genoa and let Mo round up. No big. I had time. Sleep was difficult; better to work in the cool and the dark. Much of today has been dedicated to killing sand flies, a great many of whom refuse to be blown away by strong northerlies. Many I had captured in a small hand vacuum, but when I climbed on deck and released them into the wind, they were not swept out to sea! To a one, they all flew back aboard. So much for charity. Now I’m killing them outright, when I can; they’ve grown wary. Wind is steady at 25 knots this afternoon; still, it slowly builds. The big genoa is in. I have a double tuck in the #2 and two reefs in the main and we make better then 7 knots. Sail: Both genoas poled out; Mo is running dead downwind. Navigation alarms woke me at 2am. 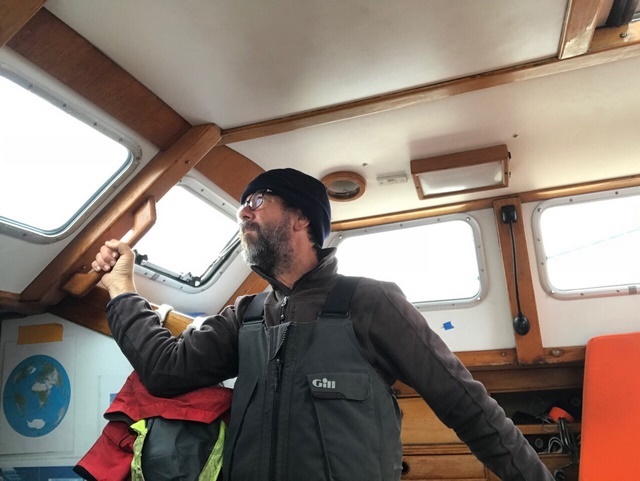 I jumped into the pilot house to examine the chart plotter, which, in night vision mode, was really too dim to distinguish anything except that that it was on. And, in my rush, I’d forgotten my glasses. Imagine the bleep bleep bleep of alarms loud enough to call up firemen from sleep and a half naked man pressing his eyes close to of the a small screen. Searching. To no avail. I returned to the salon, grabbed a shirt and glasses, and pushed the power button on the plotter. Ah. A little more brightness revealed the source of the alarm, a ship heading NW on a tight intercept, the Queen Kobe. She was listed simply as a “Cargo Vessel,” but I imagined her hold stuffed with expensive beef, beef that, given her meager 10 knots of way, she didn’t mind aging a bit enroute. Such slow speed is unusual in a merchant vessel of size; fifteen to twenty knots is more the norm, so our intercept only very slowly intercepted. Then there was the fact that winds had increased to a steady 30 knots. 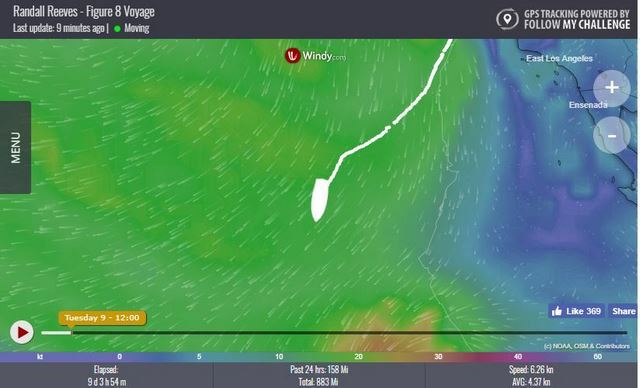 With a double reefed main and #2 genoa, Mo was a bit over-canvased and made a crazy path through the ten-foot seas. One minute our closest point of approach to Kobe was 5 miles; the next it was 1.7. Nothing for it but to stay up to ensure that these vessels inching towards each other never, in fact, met. With Sergio heading east (and long my he continue to do so), Mo should have two more days of good wind. Will use them to press south. Ran all night on main and #2, both triple reefed, taking wind on starboard quarter as the low came on slowly and steadily. 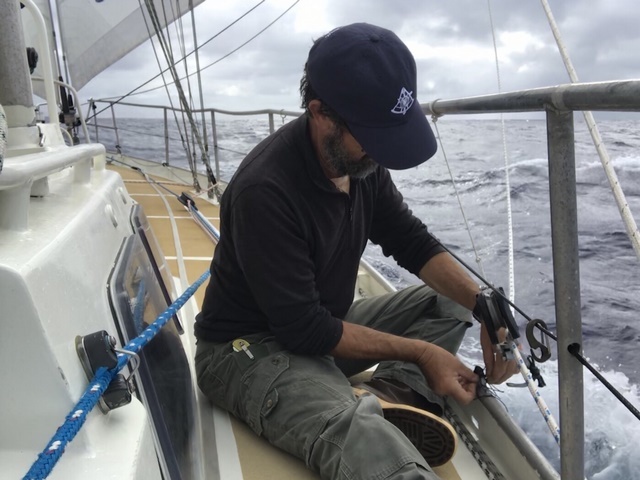 By first light, it was blowing a resolute 33 knots, and Mo was hard pressed with so much sail aft. I dressed and dropped the main. This eased Mo’s complaint, but without the pressure on the main holding us down, we rolled terribly. The bar had been falling all night and now stood at 1001, its lowest this trip. At 8am, wind suddenly eased into the teens and went south. The sky cleared. But all around remained a wall of dark cloud. The bar, 999. For an hour we sailed through the center of the low as if in a haunted place. 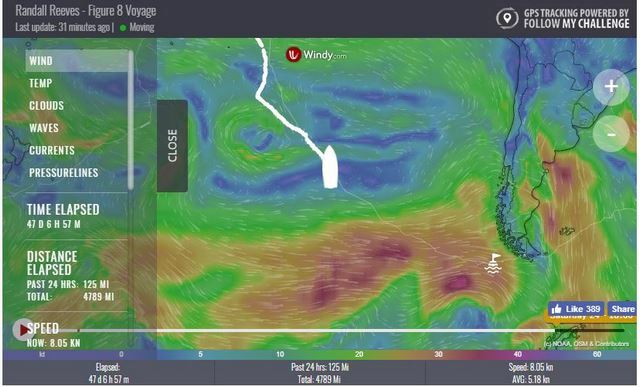 Then wind went strongly southwest, cycling between 26 and 29 knots, and has stayed there all day. We are traveling in the direction of the low. We may hold this wind for a while. Am back to two sails, both as reefed as they go. We fight to keep our course southeast. 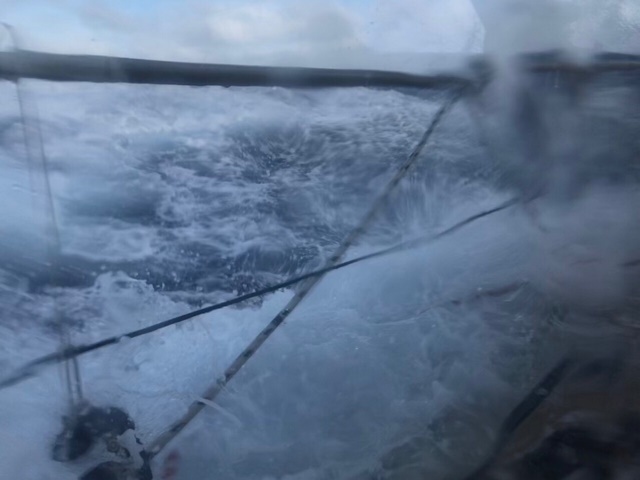 A wet, rough ride as the sea is now a mature 12 feet and breaking on our beam. I should ease into the east and give Mo a break. But we don’t need more easting at this latitude. So, I’m pushing for some southing. Since last sail change, this was before noon, I haven’t done much but pull Monte’s strings occasionally and watch, but it’s a tiring watch. Am dressed in foulies, ready to go. Just in case. Sky: Broken cumulus and strato cumulus. A sky that means trouble. Bar(mb): 1010, falling. 1006 by 6pm. Sail: Big genoa and main, plus the lowered cradle cover. Close hauled. Winds are light from the SW, and into them we reach steadily SE. But the long, slow swell coming up to meet us is large enough to steal our wind when we’re in its troughs. 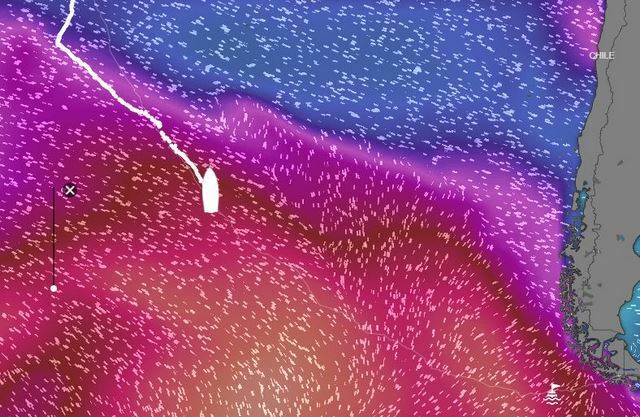 Here the sails spill and go limp and then slap full when we crest. Over and over. Hard on the gear. To scandalize a sail is to lower it part way (without reefing) or raise it part way by raising the boom. So, technically, my trick is no sandal, but it is certainly unorthodox. And the two combined actions gave us just enough speed to avoid some of the slap and bang. By way of indicating how much more southing we need to make before weathering the Figure 8’s first big cape, here are some comparisons. When we saw our first albatross the other day, Mo and I were at 30S, and I went on and on about how “we’re finally in the South.” But how far south is 30S? Well, in northern latitude terms, it’s like being in Houston, Texas, which no one would consider to be very far north at all. 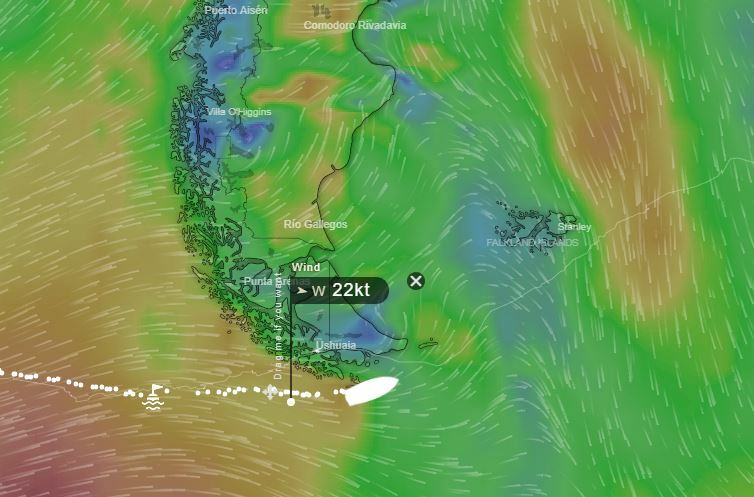 And, in northern latitude terms, how much further is Cape Horn? The Cape lies at 56S. A good northern equivalent is Sitka, Alaska, at 56N. Houston to Sitka is quite a road trip. In other words, we’ve got a ways yet. As un-south as this latitude may be, it is about to deliver our first southern blow. Right in our path is a fast developing low that starts to come together tonight and really tightens up into tomorrow, when the forecast calls for winds to 40 at the low’s center. If Mo maintains current course and speed (now SE at 7), we’ll dive right through the middle of it. And if one is in doubt about the forecast, he need only glance at the barometer (down four points since noon) and look beyond Mo’s bows, where sits a grim and foreboding sky. My scandal is tidied up. The big genoa is furled. 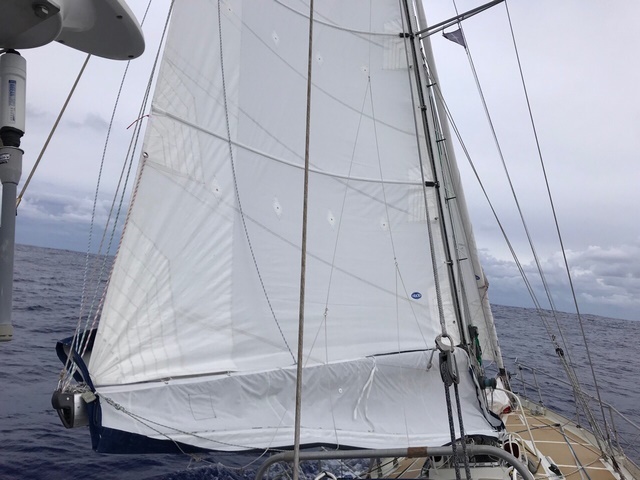 The #2 is rigged for easy reefing (both sheets to leeward and through separate blocks–one suited for full; the other for reefs). Now we plough forward and see what happens. Extra credit: I covered the dorade vents during a lull today. 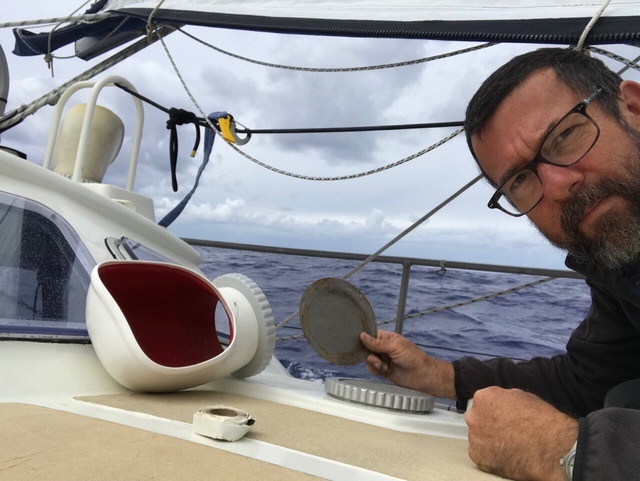 Each vent has a round, stainless steel cap that blocks the top opening and prevents water (and air, sadly) from getting into the dorage box. In very heavy going, the box can become overwhelmed by a sea and pump water into the cabin, which the cover prevents. It seems a bit early for this, except for the coming low. Sail: Tripple reefed working jib, broad reach tending toward a run. I stood watch until 3am. By this I mean I sat and watched and napped and watched as Mo worked through the gale. The sails were set; the course decision made; Monte had the helm. My job was simply to be at the ready should all hell break loose. By dark winds were in the high thirties. By late night, low forties. By early morning, back down to high thirties. My goal going into this blow was to not use the storm jib and to not deploy the drogue. 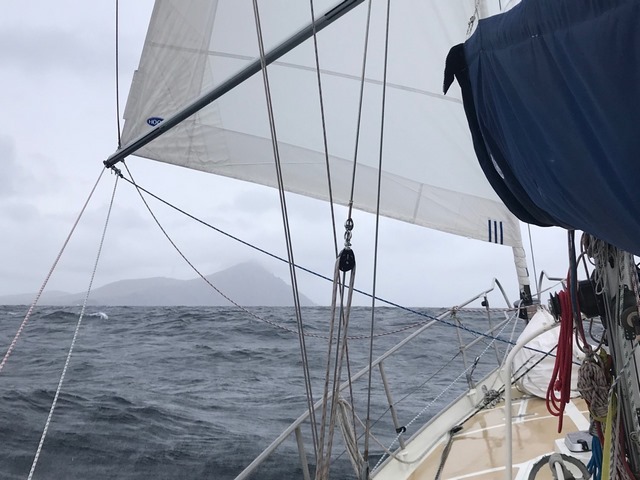 In the first case, I reefed the working headsail down hard. Let’s call it the forth reef position. There wasn’t much canvas left by the time I got done rolling, but what there was must have been three times larger than the storm jib. Mo dug in and we slogged along at a good pace, but Monte was sometimes sluggish in responding to knocks, and the little jib gybed-over several times. In the second case, I wasn’t tempted. Seas were large but not steep, and the breaking crests were lazy, falling back in on themselves. We didn’t even surf. The day has delivered steady, hard winds and rambunctious seas, blue mountains heaving up, carrying Mo skyward, and then down, down, down. They are steeper now. The break is more exuberant. But Mo has only surfed once or twice and only gone over to the windows once. I made two mistakes last night. One was to reef too heavily. 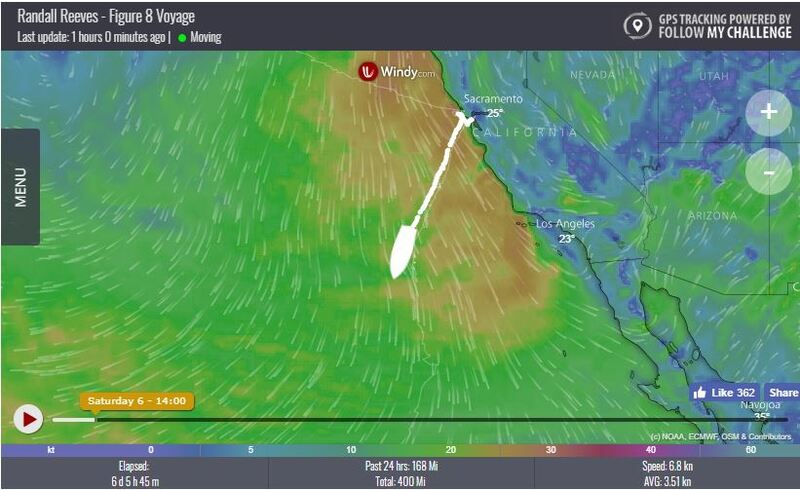 I think this is my biggest heavy weather mistake: letting the boat slow. 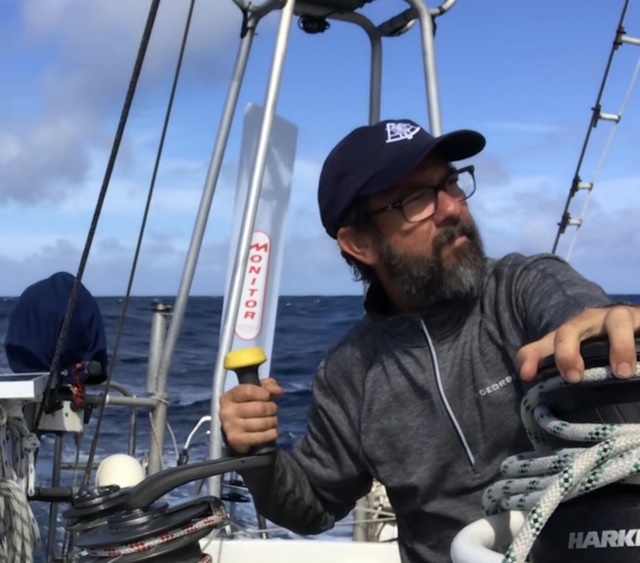 I am eager to find a set of sail that will last a blow whose upper wind velocities I don't know, but Monte needs water under the keel to maintain control. So, with winds edging again toward forty this evening, I’ve let out the “forth” reef. Now we’re at a standard three reefs. 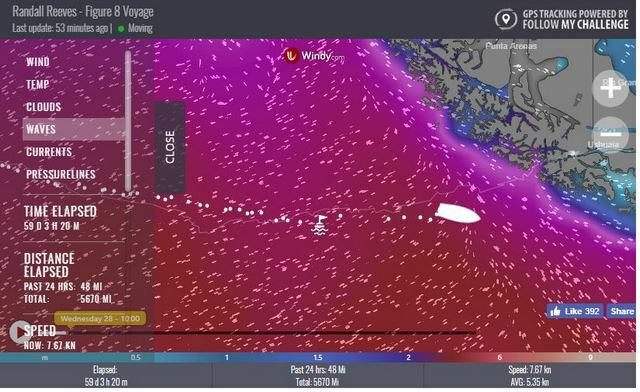 Mo pulls 7 knots easily, and (so far) Monte feels more in control. The first layer of cloud is over us now. The front for this second low should not be too far behind. Looks rough right there right now. Wondering why the reports are delayed. NSA doing a check to make sure he isn't sending secret messages from middle of the ocean? Could be a delay in getting the signal out? Sail: Twin headsails poled out; three reefs in each. 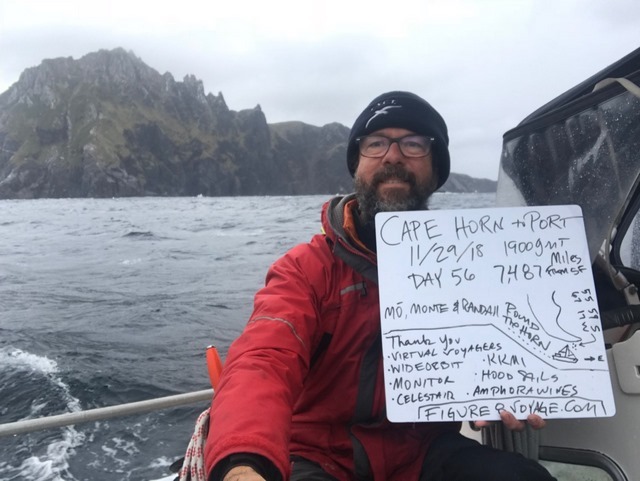 We jumping this post to the head of the line because we’ve just receive a few photos of Randall’s rounding of Cape Horn today. 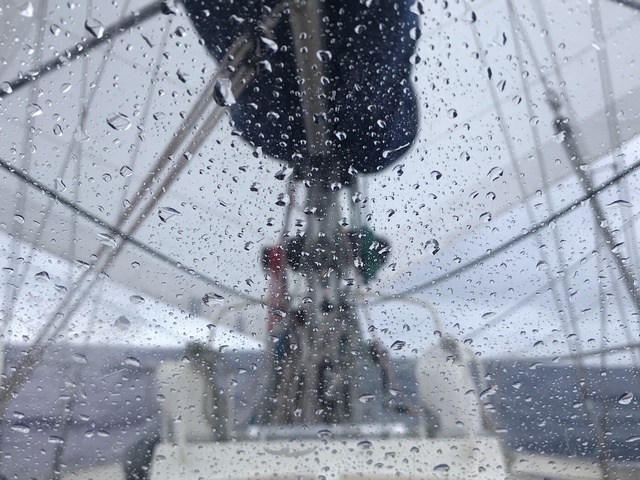 No story yet, except that it was a fine sail, if wet and cold, and he’s tired from the excitement and a few days of inconsistent sleep. 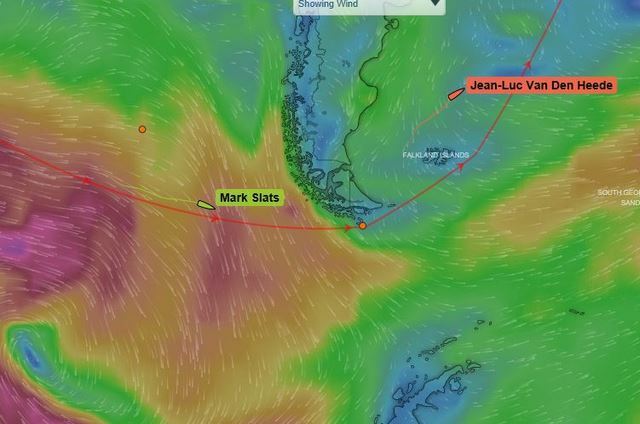 He reports he’s headed NE toward Staten Island overnight and will likely trend toward the Falklands from there. There are a couple more pre-Horn posts to come, and then we’re sure Randall will send in the rounding tale when things even out. 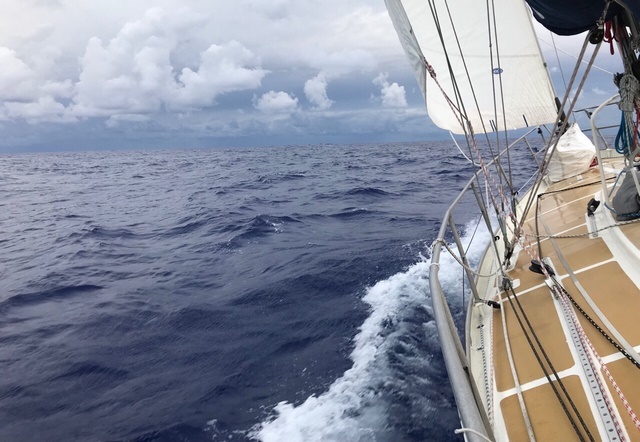 Sail: Working genoa, four-reefed as usual. Each morning the forecast calls for diminishing winds and each morning the sea spurns such a futile thing as a forecast. Yesterday I said we had surfed but not fast and that seas were breaking but not with intent. Both of those changed today. There is a sense of chaos here now. 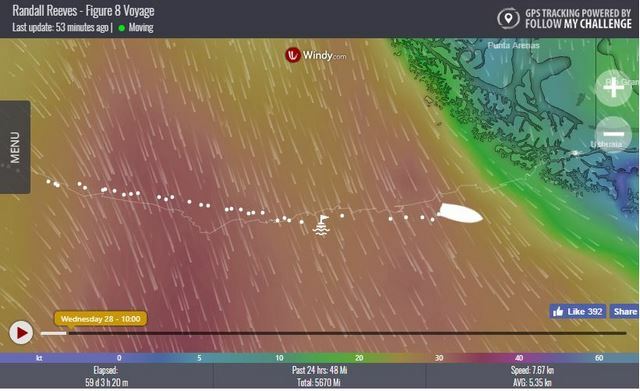 No longer satisfied with steadily blowing, winds are now only prolonged gusts, 35 knots for ten minutes and then 45 knots for ten minutes; repeat. And the sea has stood up. It is steep as a wall. The break rolls forward, mushrooming out in one giant overfall, spilling beyond and down the wave before rolling back and creating a vast whitewater rapids on the backside. And there is both a SW and NW component to the sea, this though the wind has been but a few degrees of west for the entirety of the blow. Now Mo is getting knocked around. Mostly it’s the inexplicable SW break that will catch her. 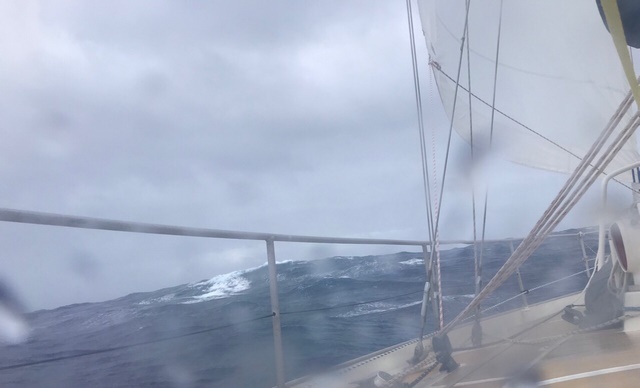 If taken by the stern, she’ll be spun around ninety degrees, and Monte will work as much as half a minute to right the course. If the breaker catchers her amidships, it will lay over her bodily. There will be a booming crashing sound below, and then all the windows in the pilot house will go dark. One such breaker was so large and loaded with so much water that when Mo stiffened up, she brought half the water back with her and delivered it from whence it came. Then there’s the surfing. It’s not as though Mo is surfing more, although she’d be forgiven for doing so. No, it was one wave that caught her dead flat astern as it broke and propelled her forward at an as yet unknown speed. I was looking out the starboard window at the time, and the entirety of it was filled with her flare of water. She roared forward ten seconds. At the end, I turned to look a the speed indicator. 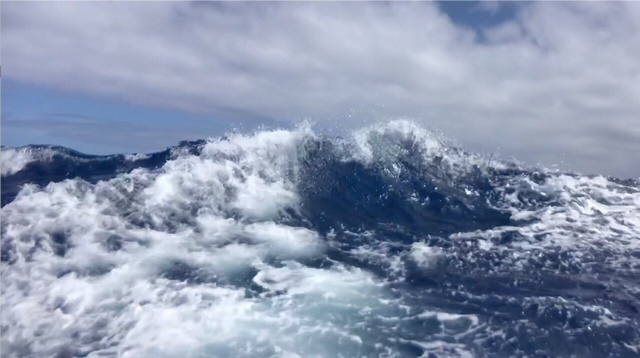 15 knots. Immediately following this, Mo rounded up and failed to come back. 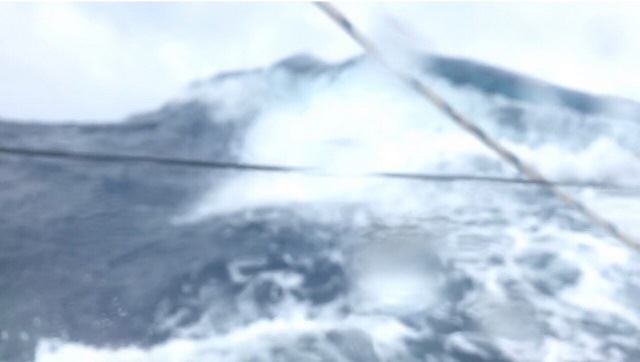 I raced on deck to find Monte’s safety tube had been broken off at the hinge. The surfing force must have been intense. 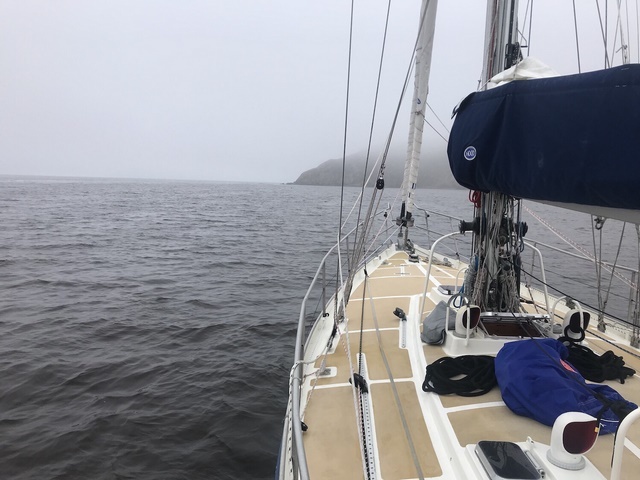 I switched on the autopilot and reduced sail by another two thirds before putting us back on course. The water paddle dangled behind the boat like a giant fish lure. As I reeled it in, I noted that one of the tiller lines on the pendulum had parted. No, on closer inspection, the knot had un-knotted. I use a figure 8 stopper knot–have for 40,000 miles of Monitor use. Never have I had one work and slip free. That explains the broken tube. With the knot undone, the pendulum was free to slam the frame, and the force of the surfing exercise severed the tube. Is this a testament to the pressure on the water paddle the last four days? Maybe. Likely it’s due to my being unable to cinch-up the knot enough (the line is extraordinarily stiff) and even with a two inch pigtail, it was able to work loose. I keep a full paddle assembly ready to go, and we were back under Monte’s able guidance within twenty minutes. For the first time ever, I clipped in for this hang-over-the-stern exchange. The sea was kind. I didn’t go underwater as could have. I didn’t even get wet. So much energy being expended; so much mass being moved from one place to another. So much weight of water being thrown on its beam’s ends. A howling. 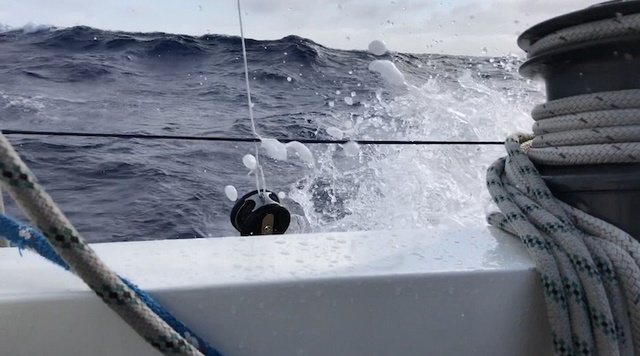 When wind gets over 38 knots, it creates a white roar in the rigging. 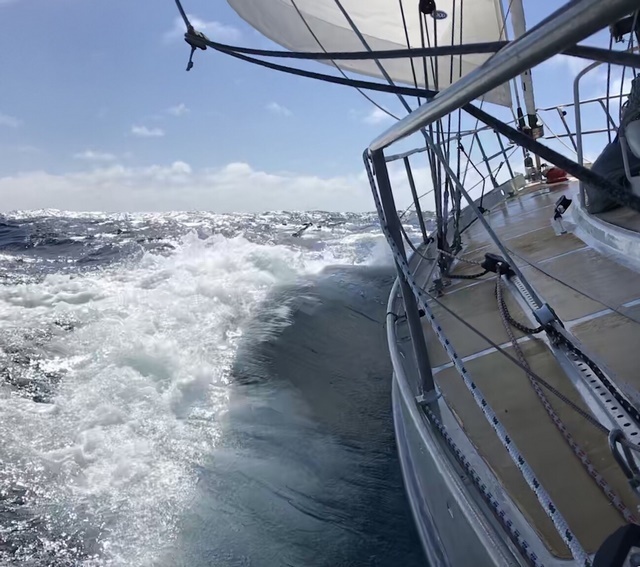 When it gets to 45 knots, the whole boat shudders continually. Could this wild place possibly exist on planet earth?